The Kadayan are one of the smaller ethnic groups in Borneo and are found mainly in South Western Sabah, Labuan , Brunei ,Brunei Bay and the North West of Sarawak. They are fair skinned, short of stature and Muslims. They live in the interior and along rivers around Sipitang ,Kuala Penyu, Weston, Linkugan Beaufort and Labuan . Their traditional occupation has been farmers Growing Rice and fruits which they sold at Tamus. Symbols of wealth and stability among the Kadayans was always the ownership of Padi. The more rice/padi one had ,the richer he was considered. Another status for the kadayan was the Pilgrimage to Mecca. Having the title of Haji was considered as a sign of honesty, piousness, humility and generosity. This was the basic means of gaining respect within the Kadayan community. Dress/Costume- In the olden days the men would wear a black jacket and black Baggy pants. The women wore a Kebaya-like short skirt and blouse. 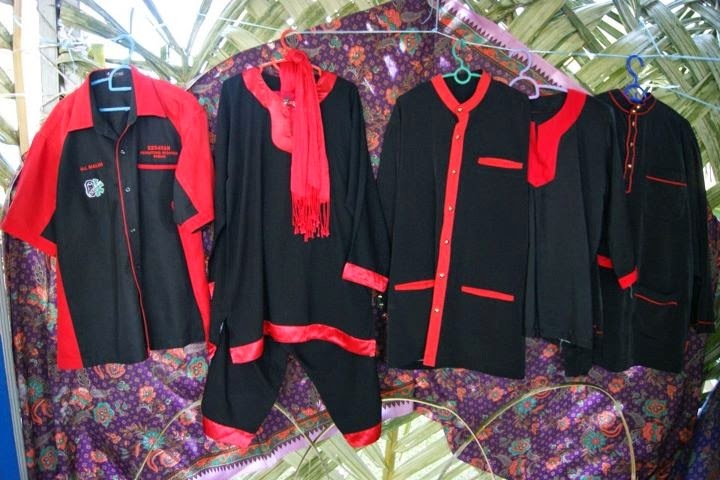 Usually black in colour , these were decorated with Silver buttons at the end of the sleeves and brooches(kerosang.). Ngamping-the pounding of cooked and dried rice after the rice harvest. The Ngamping would be celebrated by the whole village with everyone contributing some rice and food. The event was also a means to bring together the single men & women in the village who were off marriageable age so they could find a partner. Hari Raya Adil Fitri and Hari Raya Korban. Makan-makan Kenduri- This is usually held for religious festivals , wedding, engagements, circumcisions and child birth .Everybody in the village will be invited and there will be a lot of food including the Kadayan specialty called Kalupis made from glutinous rice with coconut milk , wrapped in leaves besides other meats and vegetables. A Popular past time was the spinning of Tops. ( gasing) .They are very skilled in making and spinning these tops which were made from hard woods. A Gasing Competation could take 2 or 3 days . Silat- The Kadayan are also masters of silat. They would learn the art from their fathers . Silat was thought together with spiritual education and training. Sometimes those who were good in silat also played the role of the Bomoh. To the Kadayan, Silat training was a form of self defense and spiritual training . Anding – This is a spiritual dance usually performed during times of healing when even the bomoh/ dukun ( Spiritualmediums)cannot help the sick person. The Anding is performed by a women. As the lead singer ,she sings Mantras and dances while communicating with the spirit world. The dress code is black with coloured headgear and shoes. The lead singer will sing until she goes into a trance. She will then communicate with the spirits to find the cure for the sick person. The Anding is accompanied with music from Violins, drums and the beating of Parangs. Other dances are the popular Malay dances such as Zapin, Jogget & Ronggeng. The Kadayans play the Gambus(Especially when performing Nasyids.). They also play violins and drums.